Not even a year now and big problems…Every few weeks I had to call them for a prob. One was my sitemap was mess up. The ftp was too slow. Load time was silly slow too. The answer that I got more than any other was-it was not their fault that my site had these issues. It was never their fault. All these reviews that are so bad about go-daddy have to be a bunch of BS. They are an awesome webhost and I know that it is nothing but the competition that is putting out all of the bad reviews. I have stuck with g-dadds for for many years and it has been very close to a perfect experience. Everyone says godaddy is so cheap. At first it was a low price. Then later it got worse and worse. The charges just piled up. I am also tired of whatever has been wrong with the SMTP servers. Fix it already! The relay servr was blocked for spam. So, not that I am havinganything to do with spam. My domain is clean as a whistle but I still have to suffer and am not able to get my e-mails through while it is going on. Their answer to this problem is that it is not their problem. How could it possibly not be their problem? I understand the need for patience but meanwhile am losing business like mad because if this. I use Drupal code for different sites, with different hosts and the godaddy one is always slower. It seems like godadd works fine for the domain management part but not for use if you are going to have a Drupal site. I like the fact that they answer the phone but it doesn't help much if they don't have the correct answer for you. I do beleive that the servers are just slkow wit these guys. I have wordpress sites on shared hhosting. It would work so much better for me if they had cpanel controls also. I just can't deal with the slowness, it makes things so much more dificult. Say yes to godaddy, they are better than where I was, no one is perfect and there are issues here too but I continue to be satisfied with their efforts. Try them out if you need a new host. I have been with GoDaddy for a while now and all has been fine, but lately there are some glimmers of problems. The customer service is okay but they were better, along with some other issues I'm keeping a close eye on them. I will stay put for now and hope it's just a bad spell which will end soon, I have faith it will rectify itself. Over all they provide all the basics one needs to host their site, and they do a pretty good job at that. However, I am really put off by their sleazy super bowl commercials. 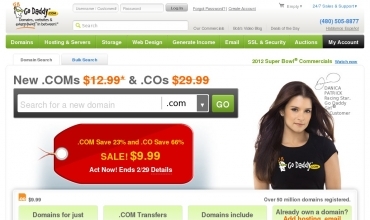 What does Danica Patrick have to do with domain names anyway?